Introducing the Mira Showers collection of digital showers, which bring the latest technological advances into your bathroom, combined with style, precision and flexibility. This smart range of automated showers offer wireless controllers that enable you to choose your preferred flow and temperature settings before you enter the shower. Using the Warm Up function, you are able to set the shower to attain your required temperature and rate of flow, after which it pauses, prepared to operate as you enter your ideal shower. All of the showers also have an Eco setting, to make sure that the water flow rate is not excessive. In addition all showers have a digital clock feature, to allow you to keep a check of time spent in the shower, whilst measuring the water usage at the same time. 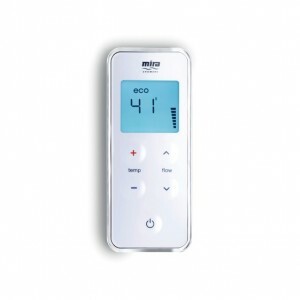 The Mira Platinum model has a wireless wall mounted controller, (picture 1), with an option for additional controllers, to allow for versatility. Prices from £660, with 2nd wireless controller – from £153.60. 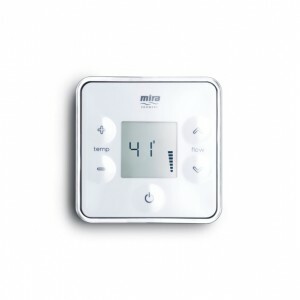 Mira Vier – This is square wireless controller, also wall mounted, (picture 2), also with additional controllers, if required. Prices from £699, with 2nd controller – from £139. 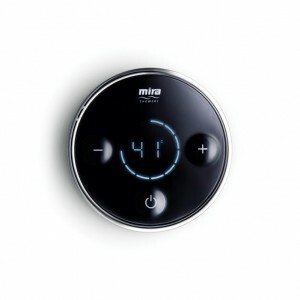 Mira Vision – This streamlined, wireless controller, (picture 3),brings a stylish contemporary look to the shower area. For a more opulent shower experience, Mira has produced Dual Digital Showers, which allow the user to divert the flow, from the overhead to the hand shower, or both together. The complete digital collection is offered with the dual option and all come with a chrome deluge 250mm, plus an extra Mira 360 shower-head. NB Digital Showers are unsuitable for use in homes that have cold mains supplies. Prices start from £660, with an additional controller, from £147.60 each. For further information and to view Mira Showers’ whole digital shower range, go to the website.